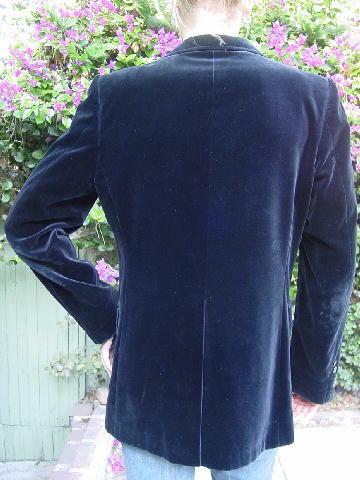 This vintage black velvet Yves Saint Laurent jacket was originally purchased at Abraham & Straus Men's Store. 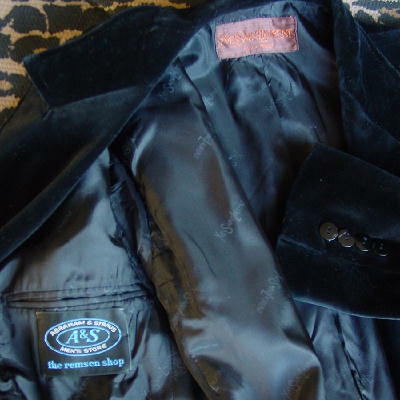 It has a nice black lining with Yves Saint Laurent printed in gray all over the lining. The elbows have a tiny bit of that "well-loved" look. There is a faint thin angled line on the upper center back. 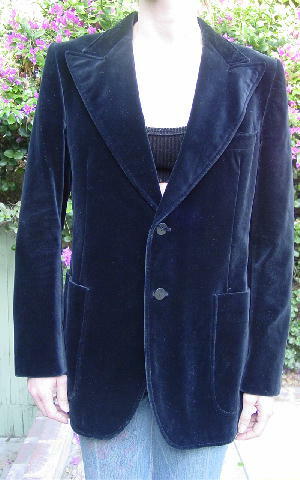 The front has a 2-button closure and wide lapels. There are two lower deep open pockets and one breast pocket, and the long sleeves have 4 buttons on each. The buttons are a shiny black, and there is a 11 3/4" vertical back vent. It was made in France. shoulder to end of sleeve 25 1/4"
shoulder pad to end of sleeve 25"
shoulder to bottom side seam hem 29"